Although I remember learning how to read, I cannot remember not knowing how to interpret a topographic map. No matter where we happened to be wandering around at the time, my dad always had a USGS topo of the area. The plethora of long ago abandoned and overgrown logging roads in the wildernesses of north Arkansas, it was useful to note where they were for the next time. We noted these paths using pencil on these topos. We also noted scenic viewpoints, hidden waterfalls, nondescript entry points off forest roads and all kinds of other odds and ends we wanted to remember the location of. Thirty years later I still have fun with maps. In one form or another I have been doing this GIS thing for the better part of a decade. Oddly enough I had yet to update my method of remembering useful locations for next time. I was still scribbling on maps. This all changed recently. Finally I have updated my field data collection methods. I now actually have a GPS. I had a few criteria when looking for a GPS receiver. Rechargeable batteries on phones and other electronic gizmos never seem to hold up for very long, and when they die, they are not exceedingly easy to get charged up again. As a result I wanted something running on good old fashioned AA batteries. Also, it had to be relatively ruggedized. After all, I have a habit of spending time where it is dusty, wet, dirty, cold and hot. Finally, it had to be cheap. If there is a chance of breaking or loosing it, I don't want to cry over it. Enter the Garmin eTrex 10. This little gizmo is the cheapest of the Garmin line. While it may not be the smallest, it is affordable, moderately ruggedized and runs on (you guessed it) good old fashioned AA batteries. It is easy to find these things for right around $100. After picking up one of these recently, during my initial testing I discovered a bit of a hiccup using it with the ArcGIS for Desktop GPX to Features geoprocessing tool. It was pretty easy to fix and I documented it in a recent blog posting. Incidentally, the developer who maintains the tool picked up the posting and addressed this. This capability will be included in a future release. 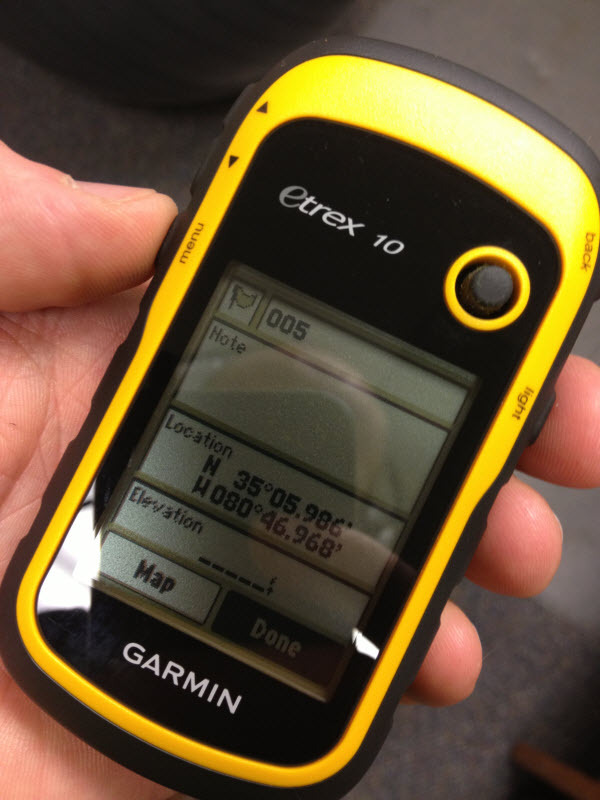 The eTrex with the modified GPX to Features tool provides the capability to collect and import data into ArcGIS. Still, the Garmin unit is just not all that great when it comes to the user interface for recording information about the individual points collected. In fact, it is kind of terrible. This is where Rite in the Rain comes in. To compliment the little Garmin, I picked up a Rite in the Rain notebook and waterproof pen. This rounds out my data collection kit. 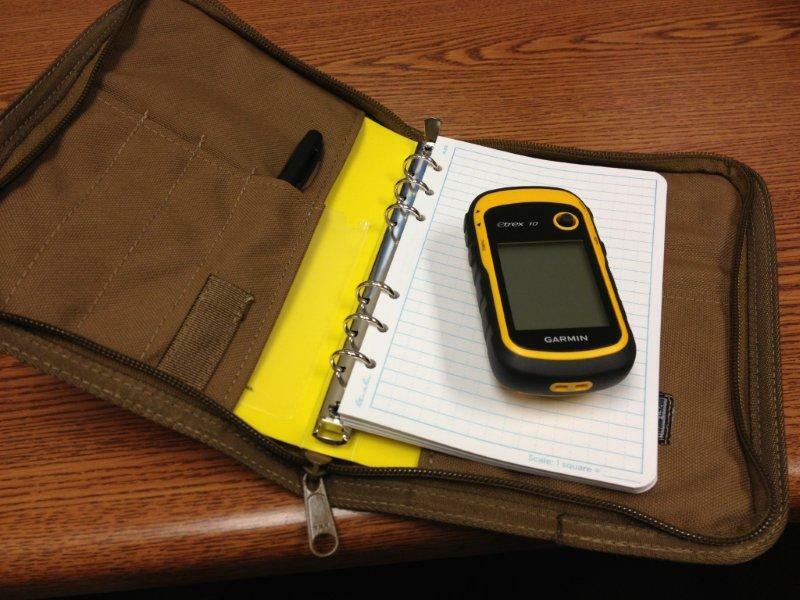 The eTrex can get the position and the notebook provides a way to record all the other information. After importing the points into ArcGIS, I can enter all the additional information in my notes into the attribute table. True, this is not the most techie way to accomplish the task, but it does enable easy data collection for most anybody, even if on a minimal budget. If just using a notebook left over from last semester, a college student could be collecting data for right around $100 and using the school computer lab for post processing. If you do not have access to ArcGIS for Desktop for this, take a look at the ArcGIS for home use program. A Garmin eTrex, a notebook and ArcGIS for Desktop...these tools combined truly enable almost anybody to make a map of their favorite backyard getaway. The best part is these maps do not wear out or get lost and are much easier to share.